I had a three-day holiday in the Philippines. I took my time deciding whether to go back given that term break was almost over. But then… Decided to come, anyway. I left Thursday night via Singapore, and then spent a couple of days at home. On Sunday, I went to the flat because it was easier to leave from there at past midnight. Right now I am back in Singapore, waiting for my flight back to the old town. I had asked permission to be absent today, but I am so bored I end up bothering people on WhatsApp anyway. Anyways, my shopping plans were thwarted because my plane is at Terminal 1. I thought I had a chance to buy Irvin’s salted egg chips at T2. But nope. Then as for Muji, I didn’t really need to buy stuff but I did, anyway, after having eggs benedict at Swensen’s and regretting that I changed a shitload of monies to SGD. Anyway, I tried the 711 at T1 for some other salted egg alternatives, but no dice. Sigh. Hey, friends, fly tigerair (soon to be scoot) at your own risk. I transited at Changi Airport last night. 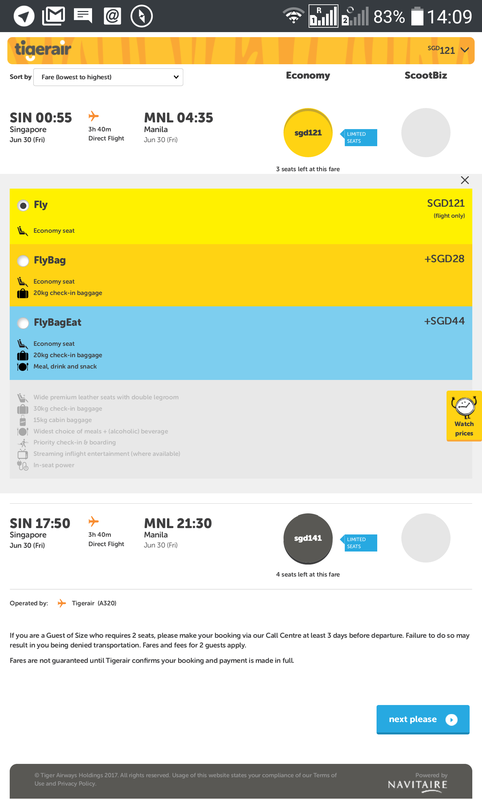 I had a tigerair flight to Manila and I was unpleasantly surprised by the fact that they were charging me 40SGD because my carry on luggage went beyond their 10kg limit. When my backpack was being weighed, I told the staff that my heavy laptop was inside. He said it should be included and even told me have the stuff I bought at the airport be weighed as well, despite my protests. I booked my flight via Traveloka, where there was no information about such fees being applied. Today I also tried making a booking on their website and there was no info on that either. 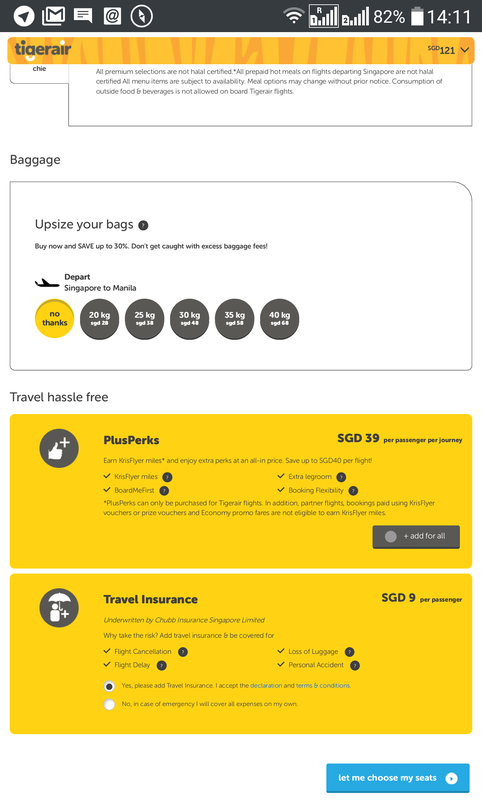 In contrast, if you look at the FlyBagEat option, you only need to add 44 SGD to have more legroom, 30kg checked in baggage, 15kg hand carried baggage, and a meal. But of course it is not in their best interest to let their customers know that. There were also many angry and frustrated passengers who were caught unaware last night. Most of them just paid up. Some were even trying to bargain. One guy started layering his clothes. I just sulked with a very angry face. So yeah, I have already made complaints to Traveloka and also Changi Aiport (I mean come on, I buy stuff at the airport and it has to be weighed, too?). Not gonna complain to tigerair, but I told all of my friends to avoid it. 1. Ask a friend to hold your bags for you while you check in. 2. If you don’t have a friend, left luggage is a cheaper option to letting a stranger watch your luggage for you (and in this day and age, no one will agree to that anyway). 3. Do your shopping after checking in. You can have better use for 40SGD at the airport instead of losing it to these scammers.